By 1977 Davis was getting nowhere with the comic. He simply couldn’t understand why nobody else found gnats as funny as him- and yes, unlike Garfield, Gnorm Gnat was supposed to be very funny. For almost five years he had been printing the gag-a-day comic in a small Indiana town newspaper called the Pendleton Times. The comic, as noted, featured a collection of sarcastic bugs, like the title character Gnorm Gnat, a fruit fly with two weeks to live, a dumb dense slug, and an intellectual worm named Dr. Rosenwurm. This sealed the bug’s fate. Shortly thereafter he had Gnorm Gnat unceremoniously disposed of by a foot, and ceased making the comic. Now, it was time for Davis to come up with a new comic strip- one that he hoped would be universally relatable. Described as someone with “the soul of an ad-man” who cut his teeth in an advertising agency before trying his hand at comics, Davis studied the popular syndicated comic strips of the day to see if he could spot a common thread between them. During his research, he noticed that comic strips about or starring dogs, like Peanuts and Marmaduke, were especially popular. This, of course, makes sense because dogs have literally been bred for centuries to be what humans consider awesome. With the character and his personality more or less set, Davis came up with, as Chris Suellentrop from Slate so eloquently put it, “a stable of recurring, repetitive jokes for the cat”, that he could recycle endlessly, allowing him to churn out Garfield comics with as little effort as possible, which is amazingly fitting if you think about it. Going back to the marketing side of things, Davis once again drew inspiration from Peanuts noting in an anniversary compendium of Garfield strips that he saw the commercialisation of Snoopy in particular as, to quote, “a template that I could apply to Garfield”. And this wasn’t just for the animal appeal, but also because, as he told the Chicago Sun-Times, “After 50 years, Snoopy was still laying in that dog house, and rather than getting old, it actually has the opposite effect.” In other words, the Snoopy template allowed for continuing the same old gags over and over and over again with people still loving it, and buying the merchandise, eventually if nothing else but for nostalgia’s sake. In June of 1978 Garfield found its way into some 40 newspapers. Less than two years later it could be found across the world in over 800. By late 1982, four and half years after the debut, it was in a whopping 1,400 newspapers. Fast forward a few decades and even in 2013 with the downfall of many newspapers world-wide, Garfield still showed up in over 2,500 newspapers and journals. 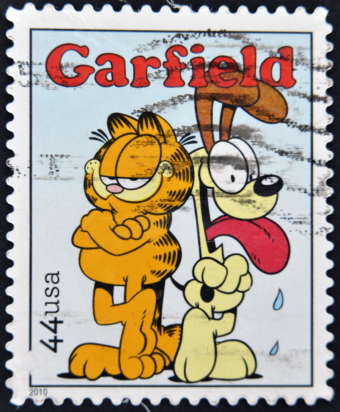 In fact, Garfield currently holds a Guinness World Record for being the most widely syndicated comic strip in history. Using this platform of the most read comic in the world, Davis was able to easily execute stage two of his, quite frankly, genius plan- merchandising. Unlike the creator of Calvin and Hobbes, Bill Watterson, who famously not only passed up, but fought vehemently against merchandising Calvin and Hobbes beyond the comic material itself (and, note, this includes the near ubiquitous and completely unauthorized “Calvin peeing” stickers which Watterson joked of, “long after the strip is forgotten, those decals are my ticket to immortality”), Davis had no qualms about leveraging his ingenious creation to squeeze every dime possible out of it. That said, in all merchandising and licensing opportunities, he does strongly consider how something might harm the brand, whether because of poor association or simply oversaturation to the point of people getting sick of Garfield. But the plush dolls weren’t the only place money was pouring in from. In fact, even in the early days of the comic’s popularity, Davis admitted to only spending a little over a dozen hours a week working on the comic itself, with another 60 or so hours spent coming up with and managing merchandising and licensing deals and ideas. This includes everything from your standard books (which by the way at one point saw Garfield with 7 such books on the New York Times Bestseller List at the same time), cartoon specials, lunch boxes and stuffed animals, to Garfield slot machines in Las Vegas, toilet seat covers, a Garfield Restaurant, and even educational material, with Garfield licensed in some regions for use in textbooks teaching children English. You might at this point be wondering how much Davis has made from Garfield given its success both as a comic on its own merits and the behemoth that is the merchandising side of the business. Well, nobody knows for sure but Davis and presumably the IRS. That said, it is known that sales of Garfield merchandise grosses in the ballpark of billion dollars- yes billion- every single year world-wide, even today. So we guess you kind of have to hand it to Davis- not only did he achieve his goal of creating an enjoyable comic for the masses, but also has masterfully run the business side of things, making him probably the most successful comic creator in history on both fronts, with no end in sight. Yes, unlike so many other comic artists over the years who’ve famously very abruptly ended their strips when their bank accounts were large enough and they felt they’d hit a creative roadblock, Davis stated he has no such intention. And by the way, unlike his famous character, Davis has on several occasions noted he himself loves Mondays. Wrong. Heathcliff is a comic strip cat created by George Gately, who’s been around since 1973.